Holiday Devotional Reflections Ezine, Issue #0025. A Monthly Holiday Devotions Ezine with a Mother's Day devotional for the month of May, entitled, Godly Mothers. 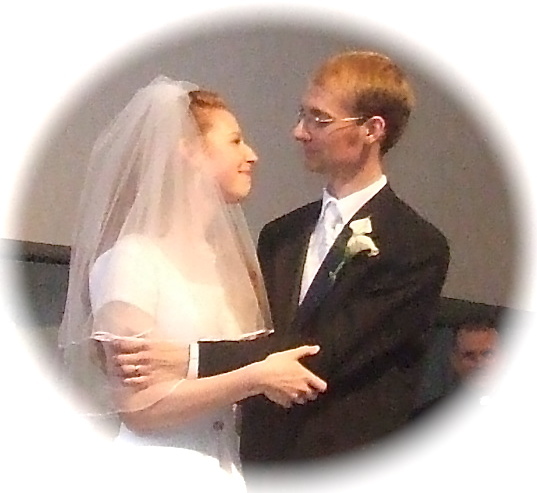 The picture shown above is of my daughter and son on their wedding day. My daughter is not yet a mother, but I think you will see the appropriateness of using this picture when you read this month's devotional. 3 I thank God, whom I serve, as my forefathers did, with a clear conscience, as night and day I constantly remember you in my prayers. 4 Recalling your tears, I long to see you, so that I may be filled with joy. 5 I have been reminded of your sincere faith, which first lived in your grandmother Lois and in your mother Eunice and, I am persuaded, now lives in you also. I just finished writing a teen devotional that will be published in my Devotionals for Teens Blog on the topic of Mother's Day, and realized that, as most of you are probably not regular readers of the Teen Devotionals blog, you might appreciate receiving this devotional as well. Although it was written with teens in mind, I think you will appreciate the truths that are relevant to us all. I thought of the many examples we have of Godly mothers in the Bible, but decided to use this Bible passage from 1 Timothy to consider the topic of Godly mothers. Paul, in speaking to Timothy, penned the words shown above from 2 Timothy 1. Especially relevant is verse 5. As teen girls, what kind of influence will you have on your own children? As teen guys, what kind of wife will you choose to be the mother of your children? Nothing, absolutely nothing, is more important when looking ahead to marriage, than considering, first, your own relationship to God, and second the relationship to God of your future spouse. What kind of a mother do you have? Do you, like Timothy, have a godly mother who encourages you in the Lord? Do you have a mother who does not know the Lord? Thank God, especially today (Mother's Day), for the mother He has given to you. God has chosen this mother just for you, and God has chosen you to be her child. What kind of a child are you? Do you constantly argue and resist your mother in everything she says and does, or do you encourage her by your own Godly living? Pray that God would help you to love and appreciate your mother, and that you would encourage her to be faithful to God. She needs your prayers just as much as you need her prayers. PS For those of us who have lost our mothers, I trust this devotional will be a great source of encouragement. For more devotions check my Daily Bible Devotions where we are currently doing a series called, from the book of John. We are currently in one of my favorite chapters in the Bible, John 14. When things get really tough in life, it is such a blessing to remember that Jesus is preparing mansions in heaven for us right now! Also, be sure to visit my Free Christian eBooks page. I am in the process of writing free monthly devotions for the entire year. So far the months of June, July, August, September, October, November, December, and January are completed. Check it out! You will also find some great eBooks by Rev. Bobby Keating, as well as my newest monthly devotional, Devotional Reflections for January. Also, do not forget to sign up for my monthly Devotional Reflections Newsletter on my web site's Home page . The format is entirely different than this ezine--hope you will check it out. And, did I forget to mention? You will receive a free download of my eBook, 20 Devotions on Love for signing up. Coming in the summer: My new online bookstore, called Croft Books and More!